This is Part 2 of a description of a talk I was invited to give to staff at the legal firm of Lima and Falcao by the owner Tiago Lima. It took place in Recife, northeast Brazil in November 2018. In a previous post I discussed some of the attributes for a successful career and the tricky art of learning from mistakes. The rest of the talk focused on the role of taking and giving strategic advice and the importance of listening skills. To illustrate this I gave an example from my own career, when I was doing my PhD in particle physics at Imperial College, London (it’s to be found embedded in a much longer article entitled The Higgs Effect). On one occasion word went out that he (Prof Abdus Salam, who won the Nobel Prize for Physics in 1979) wanted to interview each of the particle physics PhD students. There was a handful of us and no reason was given. This was quite unusual as we interacted with all the other staff on a regular and easy basis and communication was excellent. In my interview somehow or other I started going on about the low public profile of particle physics even though some amazing advances were being made and they weren’t being well communicated to the public. He agreed with me, said it was an important topic and suggested I seize the opportunity and do it myself! This totally shocked me as this wasn’t the sort of career or activity I had in mind, although with hindsight it might have been excellent advice. I’ve often thought about this and how best to benefit when being in the (rare) situation of talking to someone who can give advice from a genuinely big picture. My guess is that they’ll always say something you don’t expect and you might even find a bit odd! That’s because they see things completely differently (years of experience, wider network, deeper insights). However I think the smart thing to do is to write the idea or suggestion down, leave it a while (let it incubate) and then just openly think about it even if it contradicts practically everything else you’re doing. I’m not saying I would have been good at popular science or that I would (in reality) have enjoyed it but I did lose an opportunity by not giving it the attention it deserved. As we’re often told, chance favours the prepared mind. In this case, being prepared for the unexpected! The general point is to listen carefully to the advice given and not be judgemental. If the suggestions are not what you were expecting (as in the example above), let the ideas incubate slowly and try to keep an open mind on new possibilities. There may even be connections or opportunities that are relatively easy to develop and try out. In the example above, I could have written a short article for a popular magazine to see what was involved (namely the time and effort required). It would have been a diversion from my main research but a low cost and low risk ‘experiment’. Nowadays, writing articles and books popularising modern science is fairly common and whole areas of bookshops are devoted to this area. Just try it, it really is hard although presumably gets easier with practice. 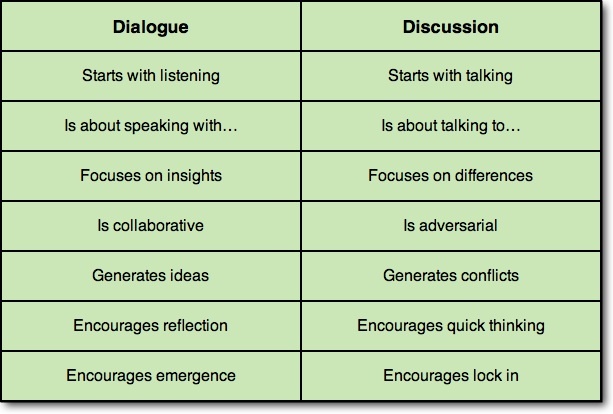 The table below indicates the common way we converse (discussion) and an improved way (dialogue). If you’re not convinced, just eaves-drop on most conversations, you’ll see that they are usually very one-sided and limited. As a practical tip, you could experiment with inserting some dialogue in place of discussion and see what results. This may be especially useful in situations where there is a conflict or established set views or the matter is very important. In fact this slide created the most interest which is revealing as energetic conversation is a strong feature of Brazilian culture! Many thanks to Tiago Lima for the invitation to give a talk and Artur Pimentel and Kathiana da Silva for organisation and questions. In November last year I was visiting the city of Recife in northeast Brazil. During the stay, I got to know Tiago Lima, the owner of the law firm Lima and Falcao. He was interested in the variety of career changes I had made and he invited me to give a talk to his staff on the insights I’d gained. As I was thinking about career insights in general this was a fortunate meeting of minds. A theme for the talk was to emphasise the realities of career decisions and events and to contrast this with the often simplistic stories of success found in popular business and personal development books. This and another post will elaborate on the talk. I started with giving a brief overview of my career so far. The main point is that it spans the academic, government and commercial sectors. Each sector has it’s own strengths and weaknesses and you learn different things in each one as well as with the interactions between them. I spotted this graphic whilst browsing one day and it neatly visualised quite a few things I’d been thinking about. It was produced by Sylvia Duckworth who is an award-winning educator, author, and brilliant sketchnoter. 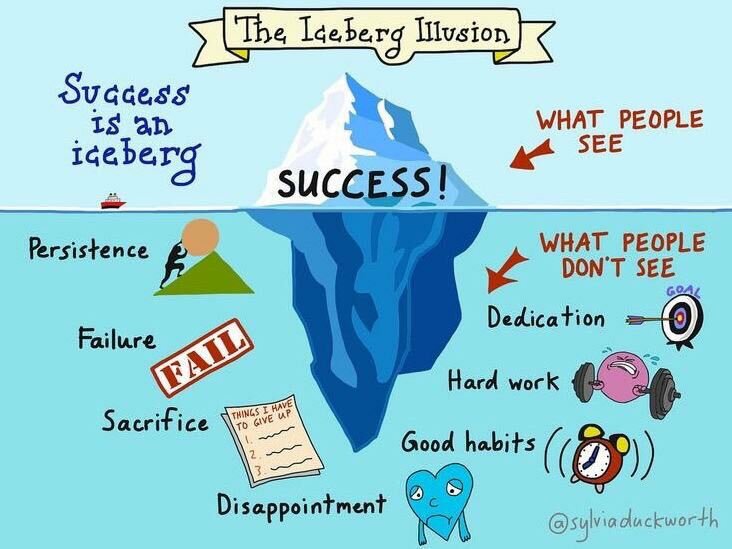 The picture illustrates the difference between a superficial and deeper analysis of success. What interested me was that the attributes on the bottom were a mixture of ‘character’ skills (determination, hard work etc) and ‘emotional’ skills (handling disappointment, failure). Just having one set of skills is unlikely to be sufficient. For this slide I explained that the ability to deal (emotionally) with failure and disappointment was essential as it is certain that every task you carry out or aim you have will not always be successful. There will generally be a continuum of results; some really good, a lot average and some rather abject. If you are perceptive and reflective you should be able to learn from all of the results to increase your overall impact. I was impressed that this advice was given to students, a very mature move. I don’t ever remember anyone saying these sorts of things to me at any time during my career but I think I would have benefitted if they had (and said them at regular intervals, it’s always easy to forget the obvious or unpleasant). 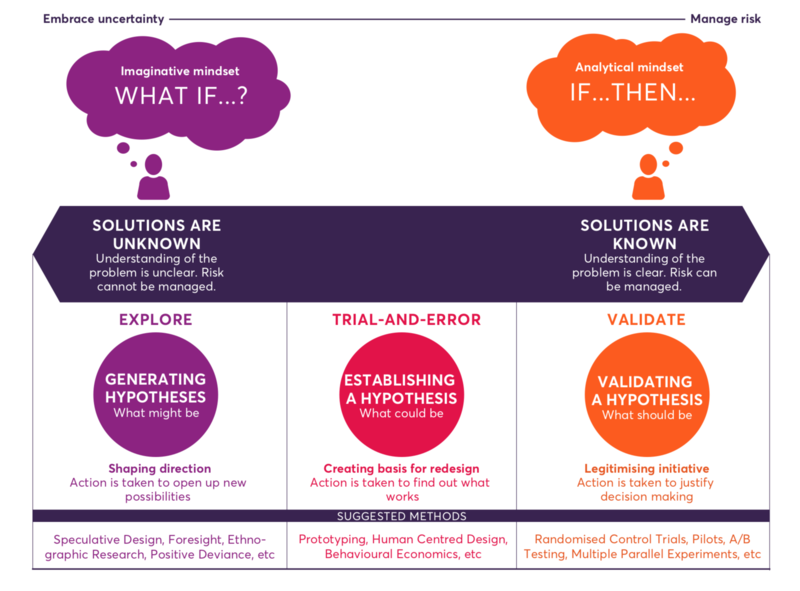 There’s also a fun graphic which illustrates what you think or hope might happen on a project and what can easily happen (the rocky road to success, see here). In general you have to be able to cope with grimy reality and not just it’s idealisation. Given that not everything will be succesful, it’s helpful to reflect on results to try to learn from mistakes. This is not easy as people often indulge in the blame game ie it was everyone’s fault but not mine! This avoids getting to the heart of the matter. In other words, it’s sometimes possible to turn a problem (perhaps a mistake) into an opportunity but this may not be straightforward and need some creative thinking. 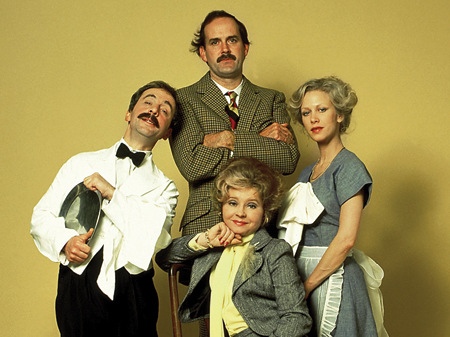 A vivid example of this is given by a Monty Python story, featuring the famous comedian John Cleese. It illustrates how open and closed thinking can yield very different results coming from the same situation. Although not mentioned in the talk, two other posts are also relevant, the preoccupation with success and the fascination of failure. Many thanks to Tiago Lima for the invitation to give a talk and to Artur Pimentel and Kathiana da Silva for organisation and questions. Starting from complex bid writing in large organisations (some were successful, others not), I’ve always had an interest in how you can best learn from ‘failure’. You can hold post-mortems of projects and bids but these are often not as helpful as you may hope (see here). Good summary: reassess, rethink and move forward (sometimes in a different direction). I like the emphasis on doing things a bit differently next time not just rehashing what you’ve done and hope it’ll be better next time (the common default). I can see that this might work although I’ve never tried it myself. The article also gives variety of tips on how you can learn from mistakes. Another common misconception: you need to learn from your mistakes. What do you really learn from mistakes? You might learn what not to do again, but how valuable is that? You still don’t know what you should do next. Contrast that with learning from your successes. Success gives you real ammunition. When something succeeds, you know what worked – and you can do it again. And the next time, you’ll probably do it even better. That shouldn’t be a surprise: it’s exactly how nature works. Evolution doesn’t linger on past failures, it’s always building upon what worked. So should you. The only comment I’d add is that sometimes it’s hard to learn from successes, just as it is from failures. Sometimes you can be successful simply through luck but even then I guess you can always argue that you can make your own luck (see here)! For context and motivation on this topic, please see my previous post. Something to reflect on and always bear in mind! Sylvia Duckworth is an award-winning teacher from Canada and uses sketchnotes (as above) extensively.